Our data focussed age has highlighted even quite recently the need for security on an ever broadening scale and colocation data centres are at the very heart of this need. Such centres handle information prioritised by its sensitivity or absolute value with highest security applied in a hierarchy from site access, per server room, per server section and per individual cabinet or cabinet compartment. They cover everything from aquisitions and mergers, corporate accounts, government records, financial services, potential manufacturing processes, policing, local government, global legal matters, online sales, personnel records, tax, media and telecoms. In fact every possible facet of our organised social economic lives. 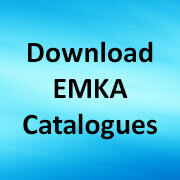 The EMKA RMS 490 and Meta ELM Database are currently installed in one such Canary Wharf facility specified to pull together access and monitoring capability at numerous data centres in US, Canada, South America, Central and Eastern Europe, Africa, Asia and the Middle East from just two centres – one in London operating 12 hours a day and the other in India for the remaining 12 hours. This enables an access request to be actioned anywhere in the world within seconds, with high speed report-back of cabinet status and subsequent log. The core of the database system is a Database Server (Microsoft SQL Server 2008 R2). Here, all components of connected ELM systems (all doors, sensors, relays, fan controllers, access cards etc) and their characteristics are provided in terms of data tables for evaluation or configuration. Writing into these tables yields corresponding changes in the ELM systems. That way you can configure ELM systems or – for example – open doors by writing into a data table or by executing SQL commands or scripts. Basically the database is an open platform for different GUI applications. Customers may use database client tools of their choice. 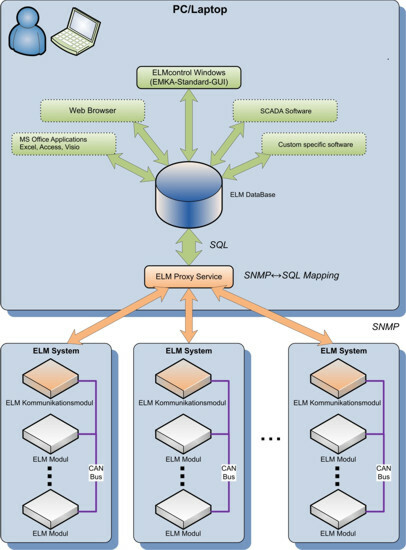 The database allows for operations (configuration, searching, monitoring …) across the boundaries of a single ELM system. Within the RMS 490 19” package 8 inputs are available for electromechanical locking systems and door contacts. Opening a lock is via keypad and pin code, transponder cards, mobile phones and of course via network and SNMP commands. Up to 4 sensors can be connected to monitor ambient conditions like temperature, humidity, acceleration (vandalism) and issue alarms via 4 relay contacts which can all be managed under one IP address. Needless to say in data centres containing some hundreds of racks it may be that only a proportion of the cabinets are required to have such a high level of security – the ELM system incorporates expandability and versatility using daisy chained modules on CAT 6 cables so that more cabinets or more sensors may be readily added e.g. for tilt and humidity. Individual cabinets may be operated locally by HID card based personnel proximity reader or even by manual key override should the need arise. Contact us for a free consultation on the needs of your colocation datacentre. Click here for brochure download. Share the post "Global electronic access for colocation centres"